This style created by the artist has been developed over a series of projects throughout the years. 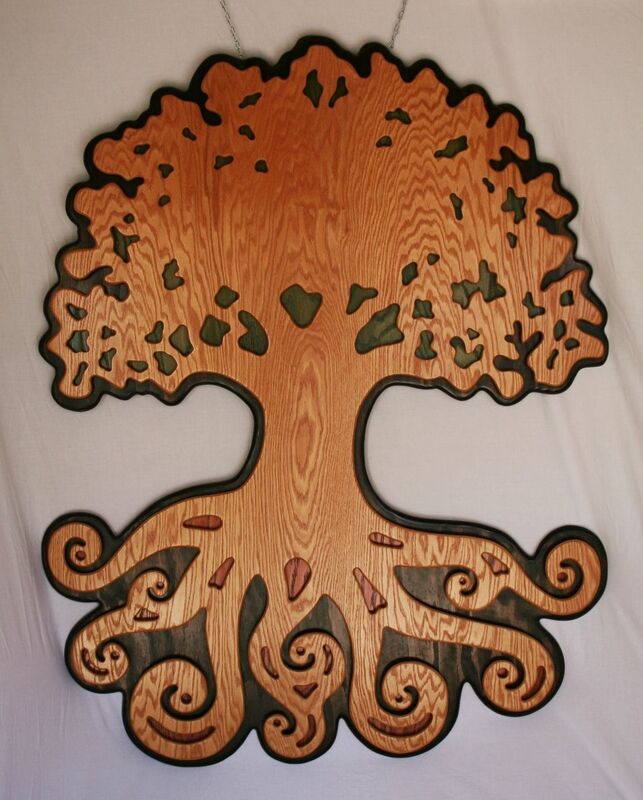 Original techniques and designs have gone into making this tree come to life. Wood and metal, glue and screws all play their part keeping this giant multi layered tree sturdy. 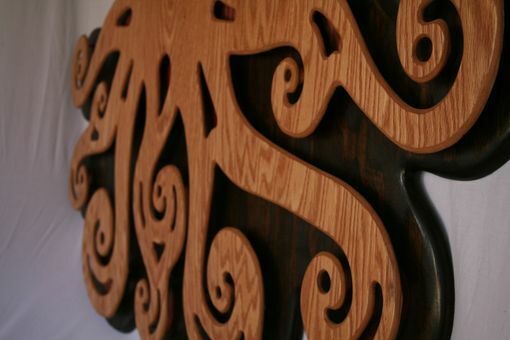 From the live oak tree, to a sculpture emulating its former self, the oak wood used in this piece has truly come full circle! 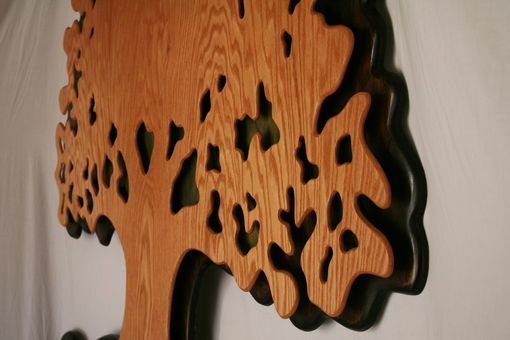 - The back layer is one solid piece of oak cut to create a silhouette border around the oak tree. It provides depth and uniformity to the shape and color of the piece. - The second layer is directly glued to the back layer. This layer consists of multiple pieces of 1/4" oak. 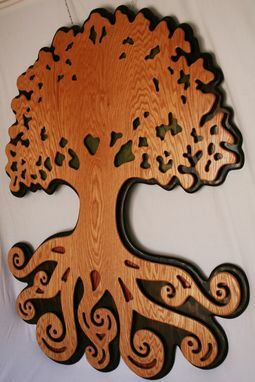 The top portion of this layer is colored green so that when looking at the piece a subtle green color shows through the silhouette of the branches. 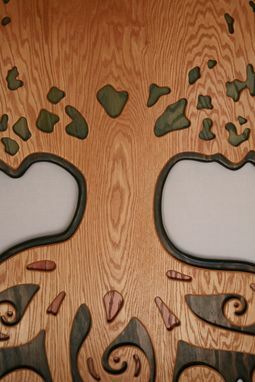 The same is done at the root level where 25 individual pieces were cut to fit directly behind the roots of the tree. These pieces were stained red and provide a splash of color to the root system. - Finally the top layer is cut from one solid piece of 1/4" oak. This single layer spent many hours in production before being mounted with a system of aluminum spacers to the back layer of the tree. 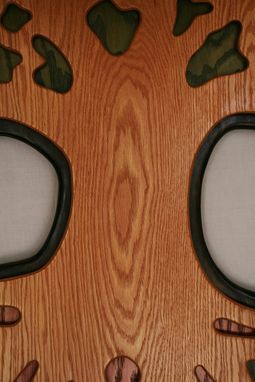 These spacers give the tree a 3rd dimension effect and provide about an inch of separation between layers. Besides the extremely complex outer lines of this layer, over 70 individual shapes were carved out of the layer giving it a very interesting look. The tree has heavy duty picture wire connected to 2 "D rings" on the back of the piece for hanging. Hardware is not provided but make sure the wall mount can hold up to 100 lbs before mounting. With an art light pointed on this piece the shadows created are amazing. The complexity and flow of the wood grain mingled with the subtle colors coming through the branches and roots give this piece many details for the eye to take in.